uAvionix, designer and manufacturer of communications, navigation, and surveillance (CNS) equipment for unmanned and manned aircraft, today announced its products have been accepted by the Director General of Civil Aviation (DGCA) of India for use within Indian-controlled airspace. In August of 2018, the Government of India Office of the Director General of Civil Aviation (DGCA) issued its Requirements for Operation of Civil Remotely Piloted Aircraft Systems (RPAS; aka “drones”) in which operational requirements are laid down for civil RPAS within India. In these regulations, DGCA requires that all RPAS weighing more than 2kg intending to operate in controlled airspace up to 400 feet (120m) be equipped with a Secondary Surveillance Radar (SSR) Mode C or S transponder, or ADS-B OUT transmitter. In addition, these aircraft must be equipped with Detect and Avoid (DAA) capability. Recently, Quantum-Systems GmbH was awarded a $3 Million RPAS contract from Survey of India to provide its Trinity+ UAV. Each Trinity+ UAV is equipped with a uAvionix ping20S low power Mode S ES ADS-B transponder and pingRX ADS-B receiver for Air Traffic Control (ATC) interoperability and DAA functionality. 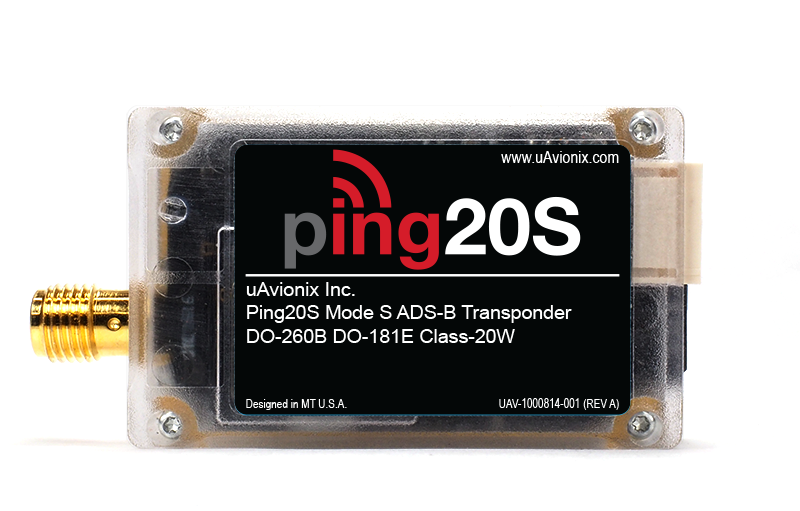 The ping20S is the world’s smallest, lightest, and most affordable Mode S ADS-B transponder, weighing only 25 grams. It allows the Trinity+ to respond to interrogations from ATC SSRs and nearby aircraft equipped with Traffic Collision Avoidance Systems (TCAS). If suitably equipped, drones are perceived as a low-cost means to undertake tasks that otherwise would cost more or take longer to accomplish. Aside from safety, uAvionix equipment holds the promise of transforming hazardous, rarely performed operations into routine, cost-effective ones. As barriers disappear, commercial enterprise can better take root and yield the prosperity that comes from an unfettered, efficiently run economy.